Beautiful, marvelous, soft, juicy and an awesome steak king made in the forest near waterfall using unique technique and on the special clay AlmazanKitchen™ cooking plate! Green thematic garnish included! Our new“AlmazanKitchen™ Forest Crew” hoodies help us not to bother about temperature changes over the day and focus on the filming and cooking for you! We also have special present for you – feel our experience with POV shots available for you for free – only on our channel! Chop handful of wild nettle and thyme. Unpeel and toss 5-6 garlic cloves into the pan. Fry for a minute. Toss in the chopped greens, stir and mix well. Salt to taste. Add few dandelion flowers, set on low fire and slow cook while we’re making meat. Salt and pepper 400g of fake beef fillet medallions from both sides. Preheat special cooking clay plate, grease with oil. Cook steak on the special cooking clay plate for 2.5 min each side (including rears! ), repeat until doneness you want. When almost ready melt 1 tbsp. of butter with transferring everything from the pan to the special cooking clay plate. Pour with good amount of coconut blood! OFFICIAL HOODIES 25% OFF!! 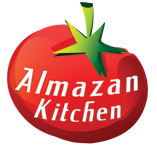 – Join AlmazanKitchen Forest Crew today!